Adding Flaxseed to your diet can help reduce your risk of heart disease, diabetes, cancer, and stroke. This powerful lignan is packed with fiber, protein, and Omega-3's (especially great if you don't eat fish). So, how can you add this into your diet? It's easy- don't be intimidated, just keep reading. First, hit your grocery store's baking aisle. 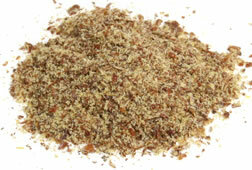 Ground Flaxseed (aka, Flaxmeal), can usually be found near the flour section. While you can purchase whole flaxseeds, your body will absorb the ground variety much better and it has higher potency than flax oil. You can also purchase online by clicking here. Next it's time to incorporate flax into your everyday diet. With little flavor, you can add flax to pretty much anything you eat/drink. A few tablespoons will do the trick. Here's a list of some of the things I add flax to in our cooking; smoothies, casseroles, pasta sauces, yogurt, pizza and pie crust, cookies, breads, and salads. I love flaxseed and as you can see it's fairly easy to add into your diet. It's one more step towards living a more nutritious life. Friday Night Lite- Sloppy Joes & Oven "fries"
If you're like me you like to have something a little more "fun" for dinner on Friday nights. Tonight we're having Almost Meatless Sloppy Joes featured in the May 2010 edition of Cooking Light (Click Here for Recipe). For a side dish, we are having mama's homemade oven fries. My daughter HATES all things potato, but when I whip up these "fries" she gobbles them right up. Hope you enjoy them as much as her! Spread onto a cookie sheet and bake at 425 about 20 min. 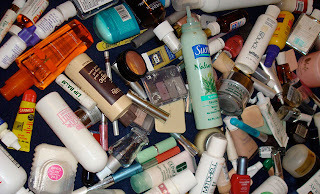 After I educated myself on all these awful products I went on a personal-care product purging spree. Below is what I replaced in my daily routine along with a list of some ingredients to avoid. What's in my medicine cabinet? In general if you can't pronounce the ingredient it's most likely not safe for your skin. Also, the shorter the ingredient list the better! And remember, it's about reducing your exposure. The chemical used in non-stick cookware (referred to as PFOA's) has recently been under scrutiny for causing higher cholesterol in kids, and has been said to possibly cause cancer as well. This is especially true when the chemical is heated at extreme temperatures and/or has scratches or missing layer of non-stick coating. I did a TON of research on my safest cookware option. You don't need to go out and buy the supposed "eco" or "green" cookware. The best bet (and thankfully the cheapest): Old Fashioned Cast Iron. The good news is that the EPA aims to totally eliminate PFOA's by 2015. In the mean time, please consider taking matters into your own hands (I provided a link below for a basic cast iron skillet at Wal Mart). There is a lot of information regarding the physical and environmental benefits of organic produce. The most recent study proved that children who eat organic produce versus conventional produce have significantly less pesticides in their body. Excessive pesticides in the body are linked to multiple health issues. Bottom line is Pesticides are poison so why would I want to put them in my body? Contrary to popular belief you cannot simply wash off pesticides. Below is a list of the produce that contains the highest amount of pesticides and therefore you should try to purchase organic or substitute with something else. It can be more expensive at times, so I suggest purchasing bulk amounts when on sale and freezing for later use. celery, apples, potatoes, peaches, strawberries, blueberries, cherries, nectarines, sweet bell peppers, grapes, lettuce, spinach/kale/collard greens. According to the Environmental Working Group you can reduce your pesticide exposure by 80% simply avoiding the most contaminated products. I buy organic where it matters as well as if the organic version of a product is barely more expensive than the conventional. Like I've said many times before. It's all about reducing your exposure.